The first STEM training I attended talked about the EDP and I quickly caught on to just how important it is. I also knew I wanted the steps displayed so students could track their thinking or at least become familiar with the design process. I made my first set of posters in colors to match my own classroom (purple, lime, turquoise). The titles are large enough to see and the steps on each poster are written in kid-friendly language. Students love these sets! Print, laminate, and attach to the wall! It's that simple. You can print the posters on your personal printer or have a store like Staples print them for you. Laminate for sure! These will last for years. Attach to a bulletin board using push pins instead of staples. They are easier to remove. If you need to attach to a concrete block wall, try hot glue at a low temperature. But use small amounts. Place the posters low enough for kids to see them. I have mine on the doors of supply cabinets. This is another poster set I knew I wanted, but could not find in a style I liked. The sets I made have a page for each step of the Scientific Method and each has a list of questions for students to use as they focus on the steps. We use these so much! 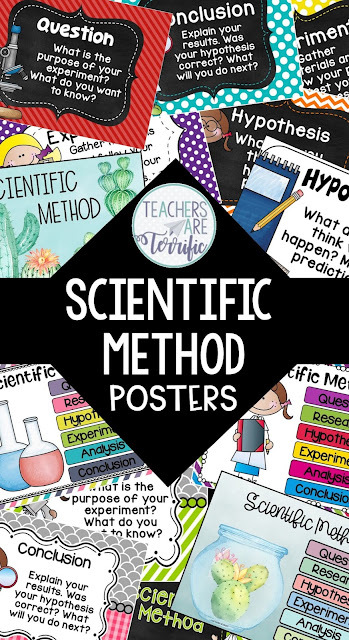 I quickly discovered that a lot of students had no idea what the Scientific Method even was, so I used the posters to get us started learning. This also made me create STEM challenges that specifically use the Scientific Method with the design work. We love the combination of these two processes! The STEM activity begins with forming a hypothesis and this is followed by testing and keeping data. The students design their final models by using the testing data. Elementary students do not have a great background in the Scientific Method! So, introduce it! I found this out by jumping into a project without pre-teaching the process and we had to stop and back up. We actually complete a flip book about the scientific method in our third-grade classes. This sets them up for future uses of the process later in the year. Simple experiments are best for teaching the Scientific Method with third and fourth graders. I introduce these early in the year and later in the year, we can tackle those more difficult challenges that have extensive testing. By 5th grade, the kids totally get it. Isn't it fun when they make those connections to prior learning? (recently) a student asked me what the 'E' in STEM meant. I was flabbergasted. Then it did occur to me that I had nothing in the room that specifically spelled it out for the students. And that made me go home and design a very simple poster set that only shares what the letters mean! 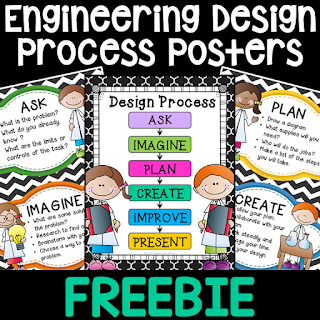 Below is another free set that shares the Engineering Design Process. The images cover only a half page, but it works great on a smaller bulletin board. Introduce the EDP and Scientific Method with images. This helps kids remember the steps! Copy a set in smaller dimensions. Just use the printing options to create 6 images on one page. 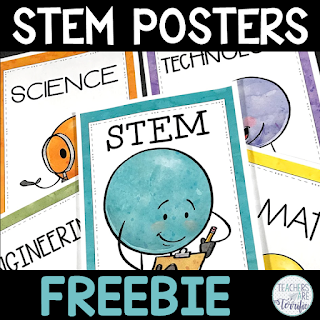 This smaller size is perfect for your student's science or STEM notebooks. Printing in gray-scale usually works, but a lot of my posters also have a limited color or total black and white option. So, Let's Sum This Up! What do you really need to get your science or STEM lab decorated? What are the essentials? 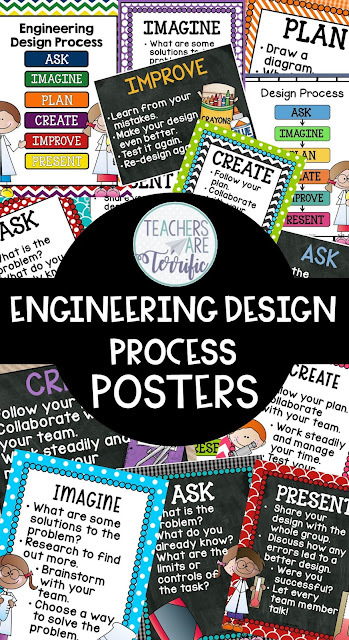 The Engineering Design Process- find some posters that you can display, create a bookmark that kids can use in their notebooks, and make sure the challenges you use are aligned with the process. The Scientific Method- again, find some great posters and display those. Your visual kids will love it. Now, I know we need a few more things and I have so many options for you in my store- but what do I use? I also have our lab rules displayed, and posters for kinds of scientists and kinds of engineers. I also have a bulletin board that is just for motivational quotes. If you are looking to just get started, grab those freebies above and add to your collection as you see a need! Have fun decorating your STEM and Science space!